As Angus Reid had said earlier in the week, it was time to see what type of statement the Lions would make at home against the Calgary Stampeders. The Lions defended their home turf in impressive fashion on Saturday night, giving their fans plenty to be thankful for on this holiday weekend. Here’s my take from the stands. I thought Travis Lulay did a beautiful job executing the game. He was without a lot of experience in his receiving unit with Simon and Bruce out, but Lulay got all the receivers involved. On the first drive alone he used Andrew Harris, Nick Moore, Kierrie Johnson and Shawn Gore. When he needed to pull the ball down and run with it, he did. 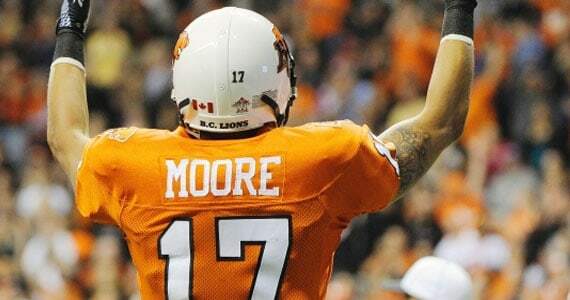 When Lulay is spreading the ball around and using his legs, the Lions offence is so much better. Andrew Harris got involved in the game early and that certainly set things up for the Lions to have better success passing the ball. His first two touches set the tone, and his carry in the dying seconds of the 1st quarter was Harris at his best, bursting through the line and carrying defenders on his back. Harris outperformed Jon Cornish head to head for the second time this season and proved that the Lions offence is much better when he is heavily involved. The defence had a strong game despite the injuries up front. I thought Khreem Smith stepped up and his fourth quarter sack of Kevin Glenn was a big play at a big time. Dante Marsh had another strong game and Ryan Phillips had his best game in a long time. His interception was a big play, because if he missed it was likely six points for the Stampeders. The Lions did a great job containing Jon Cornish once again, holding the Stamps star to 61 yards on 10 carries. Nick Moore once again did a nice job filling in for Geroy Simon leading all Lions receivers with 5 catches for 83 yards and a touchdown, and really he should have had a second in the third quarter. Courtney Taylor showed why the Lions have kept him around with a couple of nice catches and also drew a key pass interference penalty. On defence, despite some rookie aggression that was quickly reined in by Anton McKenzie, Brandon Jordan had a nice game. He was getting good push and his big frame and speed were impressive. Let’s just state the obvious right now. When Angus Reid retires he’s going directly into the Lions Ring of Honour. Is there a bigger warrior on this team? Not only did he subtly call his team out to make a statement this week, but he left the game with a reported knee problem only to return later, this despite already playing with a bad ankle. His absence was felt in the 2nd quarter when an Adam Baboulas snap sailed over the head of Travis Lulay with the Lions in the red zone, stalling the drive. Are Vancouverites starting to get it? I have to say the crowd of 31,347 was into the game last night and not only near the end of it. With bigger crowds coming as we hit the final two home games, BC Place is going to be a very tough place to play if the fans can play a role like they did Saturday. When the Lions play like they did last night and the place is hopping it makes for a great environment. Happy Thanksgiving everyone, enjoy the games on Monday and rest of your long weekend!